FORT MYERS, Fla. – On March 4, 2006, the Belmont basketball team topped Lipscomb in the ASUN championship game, using a three-point play from Justin Hare and a strong overtime performance to squeak out a 74-69 victory. 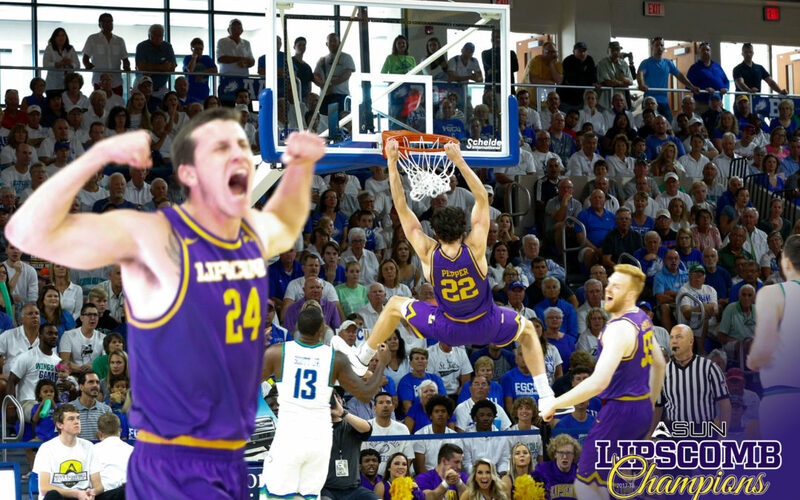 Exactly 12 years later, the Lipscomb basketball team was back in the title game, and it wasn’t going to be denied this time around. The Bisons used a 60-point first half to build a sizable lead, only to have to hold on for a 108-96 victory over Florida Gulf Coast on Sunday at Alico Arena. The difference the second time around? Head coach Casey Alexander, who was an assistant at Belmont when the Bruins advanced to their first NCAA tournament by sending the Bisons packing in 2006. The Belmont ties to the Lipscomb coaching staff (also including assistants Roger Idstrom and Steve Drabyn) have been well documented when the Battle of the Boulevard rolls around each year. In fact, the Belmont-Lipscomb games generally bring boatloads of media attention to both schools. What hasn’t been as well-documented? The Lipscomb basketball team when they aren’t playing Belmont. One glance at press row during a typical ASUN conference game yields two broadcasters, a Lumination Network staffer and occasionally a member of the local Nashville media. Since that fateful day in 2006, Belmont and Lipscomb went in opposite directions. The Bruins qualified for six additional NCAA tournaments while the Bisons watched on television. In turn, Belmont has largely overshadowed Lipscomb on the court over the last decade. That changed this season. Behind a pair of Battle of the Boulevard victories, the 2017-18 edition of the Lipscomb basketball team appeared different from the start. The two-headed monster of junior guard Garrison Mathews and junior forward Rob Marberry, along with a large supporting cast, made the Bisons difficult to defend. Despite being known for its three-point shooting, this team showed that it could win games even when the shots weren’t dropping (see Lipscomb’s 82-75 win over North Florida on Feb. 10, when the team finished just 4-of-20 from beyond the arc). However, the early season and ASUN conference success didn’t instantly translate into more fan support and media coverage. The program’s struggles since moving to NCAA Division I left some uninterested and others hesitant to fully invest. That’s life in mid-major college basketball. There is only so much a marketing or media relations staff can do – it ultimately takes a conference championship to get recognized. That’s exactly what Alexander’s staff and its players delivered this year. After battling through a grueling non-conference schedule that included Alabama, Tennessee and Purdue, the Bisons emerged from the regular season with a 20-9 record and a No. 2 seed for the ASUN tournament. Lipscomb rolled through Stetson and Jacksonville to open the tournament, setting up a championship date with No. 1-seeded FGCU, the reigning conference champion known for its Cinderella run in the 2013 NCAA tournament. The matchup looked to favor FGCU on paper. The Eagles had the experience of an ASUN title game, home-court advantage and a two-headed monster of their own in Player of the Year Brandon Goodwin and sharp-shooting guard Zach Johnson. But for whatever reason, Lipscomb has had FGCU’s number at Alico Arena. Thanks to victories in their last two trips to Fort Myers, the Bisons seemed to have a quiet confidence about them during Sunday morning’s shootaround. However, no one, not even the players themselves, could have predicted how the game played out. In front of a national TV audience and a hostile FGCU crowd, Lipscomb came out firing, hitting 15 of their first 18 shots from the field. Mathews dropped 26 points in the first half and Matt Rose added 13 of his own to push the Bisons out to a 60-31 lead at halftime. Then came the collapse. By midway through the second half, it was just a 10-point game. Johnson and Goodwin were on fire from beyond the arc and showed no signs of stopping. The Eagles eventually cut the lead to five on multiple occasions, but the Bisons held their ground. Marberry scored six points over a two-minute span to stop the bleeding, and Lipscomb’s free throw shooting over the final three minutes was enough to seal the school’s first-ever men’s basketball title and an automatic bid to the NCAA tournament. Next came the celebration, which is still ongoing and will continue for several days. After receiving the Bob Vanatta Trophy and cutting down the nets, the players gave Alexander the silent treatment in the locker room, before suddenly jumping to their feet and dosing him in water. Perhaps what’s most impressive about this team is the way that they carry themselves. It often seems that the players are simply students that just happen to play basketball, rather than vice-versa. The local and national media will find the players to be polite and gracious, just as they are when interacting with students and faculty on campus in Nashville. In an era of big egos, one-and-done phenoms and shady sports agents, the Bisons will bring a refreshing demeanor to the Big Dance. And the nation is about to get a full dose of them starting with Selection Sunday later this week. As for the team’s chances in the tournament? It will be tough sledding. Lipscomb is likely receive a No. 15 or 16 seed and be tasked with taking on a powerhouse basketball school or possibly a play-in game in Dayton next week. But none of that matters right now. Soak in the championship feeling, Lipscomb fans. Through disappointing seasons and three consecutive ASUN semifinal losses, it’s been a long time coming. All the credit goes to Alexander, his staff and the players for staying the course and doing things the right way on and off the court. Get your pen and paper ready, it’s time to bust some brackets.